The Bengal region of India is known for its rich culture and dedication to various arts and crafts and the textile industry is no exception. 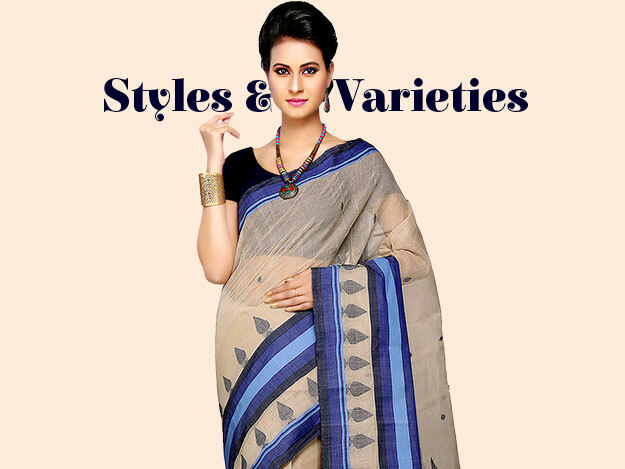 Much more than anything, the state is revered for Bengali Sarees. It produces a number of unique fabrics and weaves along with many distinctively artistic designs and patterns. These are used to make the famous Bengali sarees which are appreciated and loved all over India. 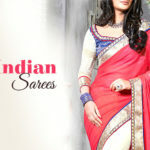 These sarees are set apart by their colorful yet subtle designs and elegant drapes. The last is a direct result of the beautiful and delicate materials with which they are crafted. Typically, woven versions of cotton and silk are employed. Bengal is particularly famous for the hand weaving industry located in its many villages. Here, entire villages are dedicated to the art of handloom weaving. This is a specialized process which involves hand weaving different colors of thread (silk, cotton or some indigenous materials) into one cloth in different patterns to create gorgeous textiles with various motifs. There are six main handloom varieties though every region has its own variations. Some have even achieved fame around the world for their delicate beauty. One such fabric is the Jamadan or Daccai Jamadan material made with cotton. The thin texture closely resembles muslin and it comes with elaborate workmanship and ornate designs. This gossamer thin fabric when richly decorated with floral and nature inspired designs has a very attractive look and drapes the contours of the body beautifully. Moreover, it is perfect for hot and sweaty summer days because of the breezy, absorbent cotton material. This is why the most desired Bengali cotton sarees are made of this fabric. However this is not the only popular Bengali saree. There are many other distinctive styles that can be worn for a wide variety of occasions, from weddings to casual parties. For instance, Bengali silk sarees are very luxurious and typically come with a lustrous finish and eye-catching Indian designs like zari work or gold prints. The Baluchari saree is yet another luxurious variation of a Bengali saree. It is a traditional symbol of affluence and wealth in Bengal; it was worn exclusively by upper class women for many centuries. These are also made of woven silk which is also polished after weaving. This gives them an attractive luster. They also come with a richly patterned pallu and border. 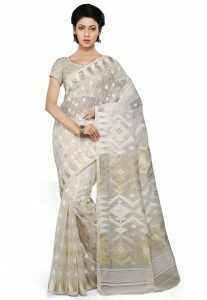 From traditional scenes from folklore, animals, flowers, fruits and leaves to modern style stripes and dots, a lot of different designs are used on this saree. On the other end of the scale is the Bengali tant saree. 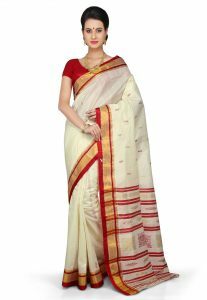 It is the preferred daily wear saree of a majority of Bengali women. It is made of traditional Bengali handloom fabrics. Though only the more costly sarees will use the expensive Jamadan fabric; cost-effective items will utilize cheaper materials. It is characterized by a thick border (usually with stripes) and a decorated pallu with floral, paisley, leaf or animal designs. 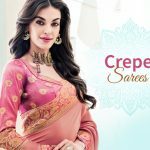 A factor which sets all these diverse types of Kolkata sarees apart is the kind of patterns and designs included on it. 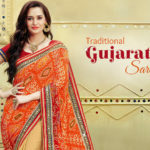 The influence of art on these sarees is clearly visible as they often display stunning designs much beyond the scope of standard Indian motifs. Thus while you will definitely find simple floral patterns, leaf designs, paisley prints and so on, you’ll also find caricatures of village life, depictions of tales from the epics, abstracted shapes inspired by modern art, detailed landscapes and lunar or solar motifs. This is not just limited to expensive silk sarees, as these kinds of unique drawings can be witnessed even on Bengali style sarees made of cotton or other cheaper fabrics. Thus, their distinctive charm can be incorporated into the daily wear wardrobe quite easily. Pulling off a Bengali saree style is not just about selecting a great saree with beautiful designs; the drape of the saree is a key aspect of what makes it unique. The Bengali traditional saree is draped in a different way than anywhere else. The pallu, instead of hanging at the back, has to be pulled over the other shoulder like a long scarf or shawl. The style of pleating and tucking also differs somewhat. The beauty of a Bengali saree is maximized in this style of drape. Conversely, thin and delicate Bengali fabrics are best suited for this kind of drape which might not work with materials from other regions. 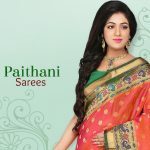 One of the latest trends in Bengali sarees is to wear them with puff-sleeve blouses made of net or with long sleeves made of net. Add a large and bold bindi, colored bangles and Polki earrings for a stylish yet traditional ethnic look. When dressing up for a party, one can select gold or silver jewelry as per the designs on the saree.